Today I left the "Firgotten Coast of FL" at 7am, crossing into the central time zone and eventually back to the eastern time zone. I followed many secondary nicely maintained roads that went to 60 mph to the AL boarder where I picked up US routes that are four lanes wide with surface crossings. 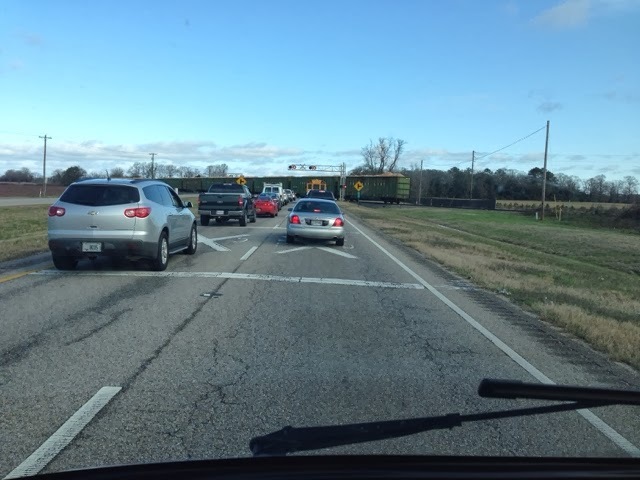 I was making great time until we came to a hault on this road because of a segment of train left on the tracks crossing all 4 lanes. Here we waited about a half hour for 2 engines to connect another segment of train, and then connect themselves, before finally moving everything along. I took this picture in AL at a rest area. I finally picked up an interstate in Columbus, GA toAtlanta for my final segment oft trip to visit my cousin Ramona & husband Doug and cousin Veronica. I arrived in Cartersville at 3:00 pm. 8 hour on the road with a couple quick stops & a train delay. I got to hang out with them this evening catching up not having seen them for a few years. Back through AL in a couple days. Is that the world's largest peanut?? Need more info about this strange picture! Manina good question. This was at a rest area in AL and I saw it from a distance and took the picture. Looking closely at the photo I see a plaque pion the ground and when taking the photo I didn't notice it, so what ever it said and it's importance is lost for this trip. 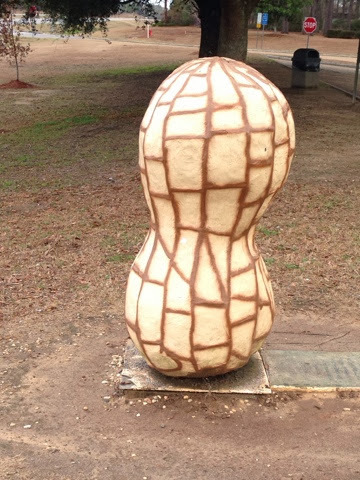 I do doubt it is the largest peanut statue as the folks in AL seem obsessed with peanuts.